Sepulcher of the Mountain God is a first level Dungeon Crawl Classics adventure locale (although, as it is intended for 8-10 characters, a smaller party would be better off playing it when they are a bit more experienced). The mini-scenario describes a relatively small, linear dungeon consisting of temples to two rival evil deities, and the connecting cavern system. One of these, Ira, is a chthonic earth god type, and the other, Gelihedres, is related to underworld waters and icky crawly things. The player characters, exploring the tomb of a tribal chief, are drawn into their conflict which now revolves around a renegade priest and two stolen magical relics. This module presents individually interesting encounters and adversaries, but has significant structural weaknesses. Taken one by one, there is some intriguing imagery of barbarous burials, pagan temples and cold, water-filled caverns (with some very neat illustrations). The adventure introduces craymites, a new subterranean race of humanoid crayfish who make pretty cool low-level opponents with a disconcerting ability they can use in combat. There are curses, relics and evil rituals which fit the themes properly. However, all of this is found in a dungeon which essentially consists of a straight line between beginning and end. This is not by itself a module-breaking issue, but there are others which add up to some rather serious problems. There is a very high likelihood over the course of the adventure that the characters are going to be affected by a powerful geas, forcing them into the plot “or else”. Even without this contrivance, there are not many interesting, meaningful choices they can make during exploration. If everything is a prepared straight path, tactics lose meaning and exploration is nonexistent. The dungeon lacks the openness and complexity which would facilitate player planning, and which is in evidence in the first product in the same module series. This is, I think, a very “2nd edition” kind of mistake. The adventure’s linear structure is also littered with roadblocks. If the party doesn’t figure out a crucial puzzle in the beginning, they will not be able to enter most of the dungeon at all, since alternate routes don’t exist, and the adventure is also clear new ones cannot be created. Later, the way forward is hidden behind a secret underwater passage within an underwater passage, which is just the place some parties will never discover. Finally, we have a combat-laden conclusion in an underground ritual site packed to the gills with human cultists, who apparently have no problem existing in a small complex whose only access point is the aforementioned secret underwater passage, yet somehow manages to contain a large campsite with beds and active fireplaces. This is a mystery that pervades the product – how does this linear under-realm function? The only ways in are a tomb and temple dedicated to a hostile god, and a flooded waterway descending even deeper into the earth. I don’t tend to pay much attention to realism, but to put it mildly, it is puzzling. 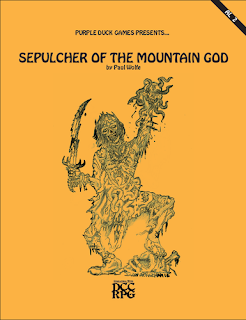 Altogether, this module is too brief and too plain for its own good: its potential for spelunking, underground exploration and approaching situations with varied tactics is limited, and what’s left is a fairly disappointing low-level scenario. Introductory modules have a special responsibility in that they should represent the best or close to the best a game can offer. This one is very far from that standard, and I cannot recommend it.